J. Jason Horejs, owner of Scottdale's Xanadu Gallery has published a book titled "Starving" to Successful | The Artist's Guide to Getting into Galleries and Selling More Art. This book was written "to help you approach galleries in an organized, systematic and professional way." The book will also help artists avoid the six mistakes listed below. This book springs from my experiences with artists. Several years ago, I began to wonder why artists were inept talking to galleries. I quickly realized most were unsuccessful because there is very little information explaining the best strategies. Mistake #1: Presenting an inconsistent body of work. Artists generally love their freedom. They want to experiment. They love a challenge. They crave variety. All good things, except when you are presenting your work to a gallery. The work you present to a gallery needs to be unified. It doesn't need to be repetitive or formulaic, but it must present you as a consistent artist with a clear vision. Often I feel I am looking at the work of multiple artists as I review a single portfolio. To avoid this problem you need to find focus in your work. If you work in several media and a variety of styles, focus on just one for the next 6-12 months. Create a body of work that feels like a "series". Once you have 20-25 gallery-ready pieces in this series, you will be ready to approach a gallery. You can further create consistency by presenting the work in a consistent way. 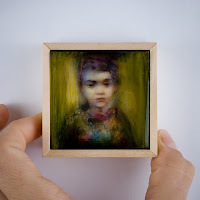 Use similar frames for paintings and photographs, similar bases for sculpture, similar settings for artistic jewelry. Make it very clear all of the work is by the same artist. If you simply can't rein your style in, consider creating multiple portfolios, one for each style. Don't confuse the galleries you approach with multiple styles in your portfolio. Mistake #2: Producing insufficient work to sustain gallery sales. Many artists create marketable work, but in quantities too low to make a gallery relationship viable. Successful artists are consistently in the studio creating artwork. You may be surprised to learn the results of a recent survey I conducted. I asked artists how many new works they created in the last twelve months. Painters responded that on average they were creating 53 pieces every twelve months. Sculptors 31. Glass artists 500! A gallery owner needs to feel confident you will replace sold art quickly and maintain high quality. They want to know if you are successful the can replenish their inventory. Don't despair if you are far from reaching this goal. Rather, look at your creative production for the last year and set a goal to increase the production by 25% in the next 12 months. 1. Dedicate time daily to your art. Maybe your schedule will only allow for two hours daily, but you will produce more by working for those two hours every day than you will by waiting for big blocks of time. Treat your studio time as sacred. Train your family and friends to respect that time. You don't interrupt them when they are at work; ask them the same courtesy when you are in the studio. 2. Set a production goal. If I could tell you the secret to producing 50, or 100 pieces per year, would you listen? Here it is: create 1 or 2 pieces per week. I know it seems overly simple, yet few artists work in a concerted disciplined way to achieve this goal. 3. Remove distractions from the studio. Move your computer to another room. Unplug the telephone. Nothing kills an artist's focus faster than the constant interruption of technology. Your inbox and voicemail will keep your messages safe while you work. Mistake #3: Delivering a portfolio in a format inconvenient for gallery review. Often your portfolio is your only chance to show your work to a gallery owner. Poorly formatted portfolios are rarely viewed. Your portfolio should be concise, simple, informative and accessible. 25 years ago, formatting a portfolio was simple. A portfolio was either a literal portfolio with sheet protectors and photos, or a slide sheet. The choices have since multiplied. CD? Digital hardbound photo-book? Pdf file? Email? Which format is the most effective? None of these, actually. Each has drawbacks limiting effectiveness. They are either too much work for the gallery owner to access, too easy to delete, or too hard for you to maintain. In my book I will show an example of a perfect portfolio. Easy to maintain, easy to share. Successful. 1. Your portfolio should contain no more than 20-25 of your most recent works. You should not create an all-inclusive portfolio. A gallery owner does not want to see your life's work. They want to see your best, most current, most relevant work. 2. On each page you should include pertinent, relevant information about the art. Include the title, the medium, the size, and the price. Don't include the date of artwork creation. 3. Place your bio, artist's statement, and resume at the back of the portfolio, not the beginning. Your artwork is the most important feature of the portfolio, don't bury it behind your info. Limit press clippings, and magazine articles to 2-3 pages. 4. Include 2-3 images of sold artwork. You should try to include at least one photo of your artwork installed. These images will establish your credibility more rapidly than any resume ever could. In "Starving" to Successful I will teach you how to create a powerful portfolio. Your new portfolio will end up in gallery owner's hands, rather than in the garbage can. Mistake #4: Lacking confidence and consistency in pricing. One of the greatest challenges facing you as an artist is knowing how to correctly value your work. Many artists price their work emotionally, and inconsistently. Galleries can't sell wrongly priced art. Worse, nothing will betray an unprepared artist like not knowing how to price his/her work. Many artists mistakenly under-price their work. They do this because they feel they are not established. They do it because their local art market won't sustain higher prices. They do it because they lack confidence in their work. In the book I will help you come up with a consistent, systematic formula for pricing your art. Is your work priced correctly? Mistake #5: Approaching the wrong galleries. My gallery is located in an art market dominated by Southwest and Western subject matter. My gallery stands apart from most of the galleries in Arizona because I have chosen art outside the norms. Yet I am constantly contacted by Western and Southwestern artists. They seem surprised and hurt when I turn them away. They could have saved us both some discomfort by researching my gallery before approaching. Which markets should you approach first? How should you research the galleries? Is it safe to work with galleries in out-of-state markets? "Starving" to Successful will teach you how to create a list of qualified, appropriate galleries to contact (I will also teach you how to approach them). Mistake #6: Submitting art through the wrong channels. Conventional wisdom, and even some highly respected art marketing books will advise you to send your portfolio with a cover letter to the gallery. You may also hear it's best to call a gallery and try to make an appointment to meet the owner. You might visit a gallery's website to learn of their submission guidelines. In my experience, these methods all guarantee failure. I will share with you a more direct, simpler approach; this approach will tremendously improve your chances of success. The approach is no secret, and yet most artists don't employ it. Find the solutions to avoiding all these mistakes in the pages of "Starving" to Successful. In addition to learning how to avoid the mistakes listed above,"Starving" Artist to Successful Artist you will also see clearly how to effectively organize your work, build your brand as an artist, communicate effectively with your galleries, and much more. I will give you concrete steps you can take to systematically prepare for gallery relationships. Please email Jason directly, jason@xanadugallery.com, or call him toll-free at the gallery at 866.483.1306 if you have any questions about the book. I am interested in your thoughts about these six mistakes, which I think are dead on target. As a gallerist I have encountered (and continue to see) all of them. I'm going to think about six separate mistakes of my own experience as a gallerist and art dealer in dealing with artists and post these here soon. Meanwhile, post your thoughts or experiences in the comments section or email them to me. Just a few weeks ago I reminded all of you that BlackRock Center for the Arts in Germantown, MD has one of the most beautiful and dramatic gallery spaces in the region, and the other day I happened to be in that area again and dropped in to see the new show there. 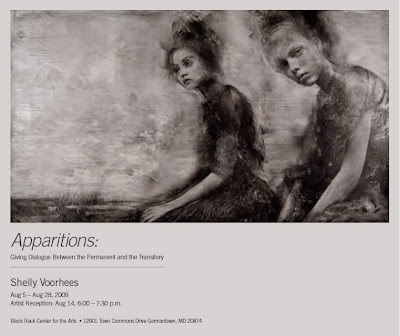 Currently on exhibition are the monochromatic ethereal paintings of Shelly Voorhees, on exhibition through August 28. It's hard to describe this exhibition without using synonyms for the word "ethereal", and since I've already dropped that adjective once, plant that description in your mind and walk with me through words. As one enters the very large and very tall space that is the gallery at Blackrock, Voorhees' paintings, most of which are very large, fit well into the space, not only because of sheer scale, but also because of the monochromatic uniformity that they present. Until you look to your left, that is. That wall hosts a series of very small, we're talking a couple of inches or so, very well done, and very attractive set of miniature portraits. See some of them here. Every single one of them is a jewel and showcases a very strong technical talent by Voorhees. You see, as any painter will tell you, it is more often than not harder to create a small, in this case, tiny, work of art that carries a punch, than a larger one. Voorhees succeeds admirably and the wall of tiny works resonates in a visual paradox in this very large gallery. Salvador Dali said it best when he said: "If you can't paint well, then paint big." This exhibition is a black and white mixed-media portraiture series of female spirits dynamically represented in moments of contemplation and emotional transition. Besides the apparitional theme, the incorporation of specific artistic elements of texture, depth, layers, luminosity, and motion, are equally important in the expressing of the merging of life's energy with the portraits ethereal. In this series, I've incorporated the expansive landscape views from my window of Lake Champlain. The natural background of the lake balances the figures beauty with their emotions. The power of the waters help to calm the viewer, and the abstracted horizontal strokes reminds us of the life that moves through us. The women are painted thinly veiled so that you can see the abstracted landscapes through their bodily shapes. I found interest in the translucent figures appearing as if their souls still remain with us. I've exemplified my own take on the traditional idea of apparitions, attempting to humanize the spirits by painting them with simple gestures in unguarded moments of contemplation and transition. These moments are expressions of the duality between movement and the still,landscape and the figure, real and the ethereal. They are psychological portraits that reflect the emotional undercurrents present in even the most unremarkable moments in life, they give tribute to women and the essence of their spirit that is eternal. While I was there looking at the show, I sat down and observed several families who were walking through the exhibition. The comments from the children seemed to imply that the artist had achieved her goal, as the comments all had a sense of the unusual, ghostly and transitory. The adults mostly commented on the beauty of the works themselves. Therein lies the key to viewing all these works at once. Voorhees uses resin and acrylic skillfully to deliver a sense of atmospheric presence in the paintings that offer the women subjects as almost a transition in the fog of grayscales, rather than a physical object. She has also chosen a sort of 19th century romantic period "look" for her models, that gives us the kind of women who Julia Margaret Cameron would have loved to photograph. And yet, as soon as I state this I am confronted by a sense of the opposite in the sense that there also seems to be a modernistic transition in the "look" of the women, trapped in my mind in a 19th century gaze and feel, to a sense of today looking from the past. 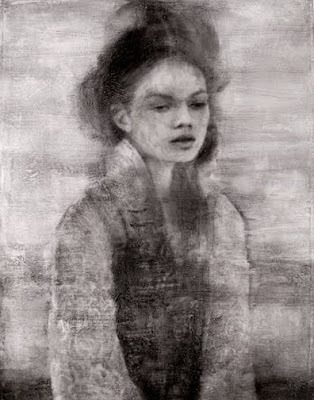 This is perhaps most visible in "Waiting," which shows a very young 21st century woman lost in 19th century thoughts. See the show online here.